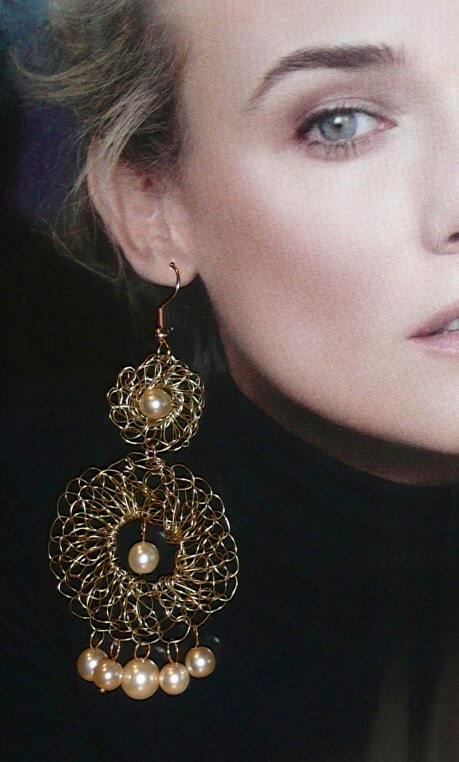 Aragon - Gold plated wire chandelier crochet earrings and vintage pearls. Statement. Elegant. You will love this luxury crochet gold plated wire chandelier, and vintage pearls earrings. They are stunning, unique, light weight and versatile. They can be the fun over-the-top accessory for a sporty look, or the perfect elegant touch to any special day or evening attire. This technique is perfect for bridal jewelry, providing the capability of designing any custom piece of jewelry for the bride and bride's maids. Contact me!